There are three (3) primary Domains of Clinical Medicine, (1) Cognitive (knowledge), (2) Psychomotor (procedures) and (3) Affective (communication). In this learning/teaching series we review all three in an integrated multimedia sequence; emphasizing fundamental basic scientific concepts of clinical importance. 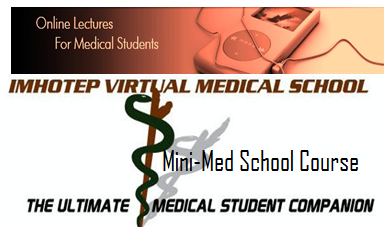 Series Target Audience: Medical students and student physicians preparing to sit for the USMLE Step 1. Content and methods of the review include| Definitions/Rationale: Outlines of the fundamental definitions, scope, and epidemiologic facts of normal human functioning and the clinical presentation of common clinical diseases and syndromes are reviewed. Causal Conditions: Provides an introductory level discussion of a systems-based approach for medical diagnosis and differential diagnosis. Approach/Treatment: Provides overview of history and physical exam, investigations, diagnosis, and treatment of classic clinical presentations. Applied Scientific Concepts: Reviews the basic scientific concepts pertinent to the diagnosis and treatment of the clinical presentations. Visual Learning Tools: In addition to the clinical presentation and objective-based review of the topics, a number of highly effective visual learning tools are used (video, audio, Mini-lectures and animations). These tools and lessons succinctly present complex and detailed concepts learned in the first two years of medical school for swift and highly effective review. Tables, Charts, Graphics and Notes: Details and lists are presented in system-based tabular and bullet format that organize information for improved retention and recall. Basic Medical Sciences Clinical Correlations: Highlights ranging from key concepts, high-yield points, mnemonics, and clinical pearls are provides. Interactive Digital Question Banks: A compilation of USMLE-style multiple choice questions is presented online in the 7 basic medical science disciplines and 9 organ-systems to assess learners comprehension of the information review and to further assist them in preparation for their exam. Use the access code provided to IVMS premium subscribes. Recommended Readings: For further in depth study of the concepts that are reviewed, a list of the most popular review texts and study material is recommended throughout. Description: Stanford Mini Med School is a series arranged and directed by Stanford's School of Medicine, and presented by the Stanford Continuing Studies program. Featuring more than thirty distinguished, faculty, scientists and physicians from Stanford's medical school, the series offers students a dynamic introduction to the world of human biology, health and disease, and the groundbreaking changes taking place in medical research and health care. Towards Understanding the Basic Medical Sciences Foundation of Clinical Medicine by Marc Imhotep Cray, M.D. Walter Cannon, Homeostasis and the Physiological Response to Stress by Marc Imhotep Cray, M.D. IVMS- Introduction| Review of the Autonomic Nervous System by Marc Imhotep Cray, M.D. IVMS General Pathology Lecture Notes by Marc Imhotep Cray, M.D. IVMS-Gross Pathology, Histopathology, Microbiology and Radiography High Yield Image Plates by Marc Imhotep Cray, M.D.